At the end of the colonial period in 1960, the Tiv experienced an explosion of cultural expression. They invented the Kwagh-Hir masquerade, which translates to ‘something magical’ (in the Tiv language, both the ‘gh’ and ‘r’ are silent, so it is pronounced ‘Kwaa-Hee’). The ceremony reasserted many of the traditional beliefs that had been diluted during the period of British rule and began only with marionettes. It later grew to incorporate masks, and eventually, colossal body masks. Incredibly, the Tiv never had a masquerade tradition before the Kwagh-Hir. It was a brand-new ceremony that strayed far from traditional norms: figures didn’t have to look like those that the Tiv traditionally produced. 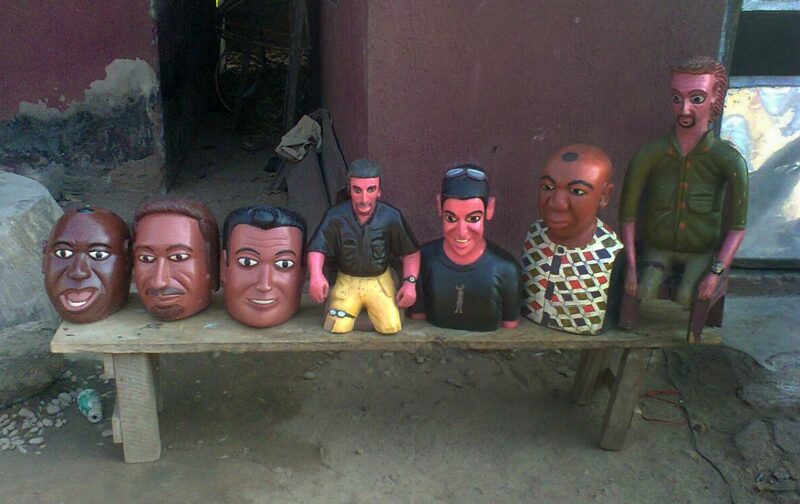 Instead, they could be Elvis, they could be Igbo, they could be Hollywood, they could be Yoruba. The new Tiv art form was unrestricted and wildly expressive. Another character, entitled Ormbaiv, depicted a European in a Western suit and tie being executed. 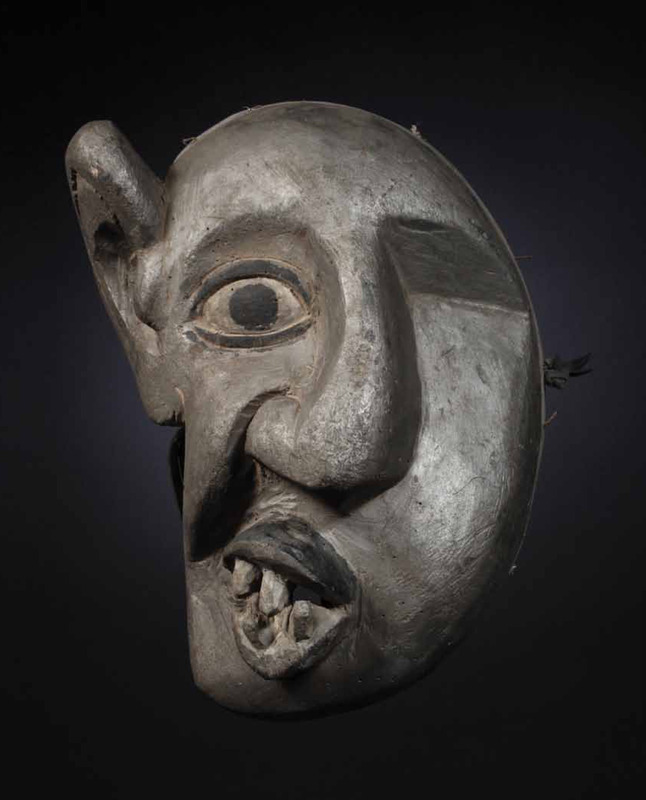 However, the majority of the Kwagh-Hir masks depict the omnipresent adzov spirits that live outside Tiv villages, who can destroy those who disobey them in their angry moments of retribution; they are reminders to follow Tiv traditions. But then many other Kwagh-Hir masks teach about enormously practical lessons, like, now that the British aren’t forcing you to buy infant formula, it’s okay to breastfeed your baby again. 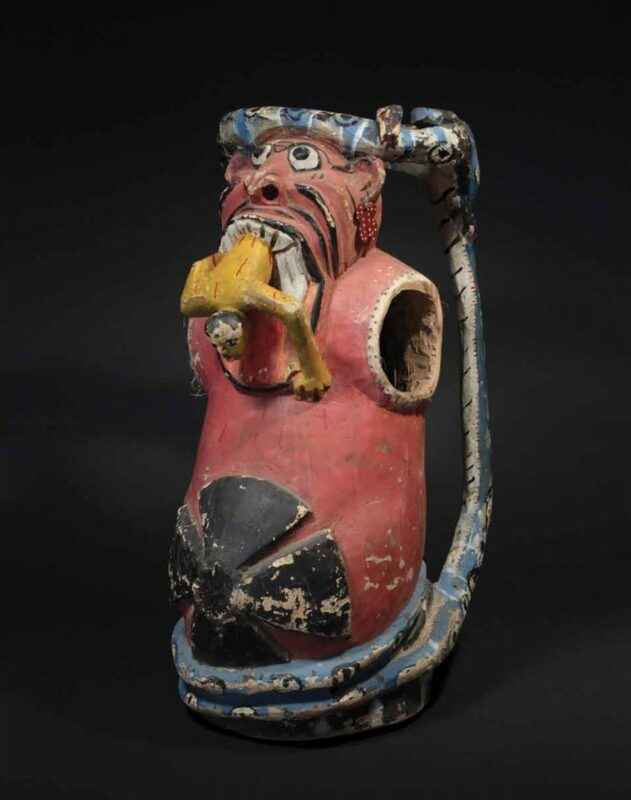 Today, many new practical masks have been added to the Kwagh-Hir, like Anakande, who was introduced in 1989, with the intention of normalising the previously taboo topic of HIV/AIDS. Anakande quickly became a favourite character, as it is danced with wild, vigorous movements. Spitting up fluids through a straw built into the mask, the dancer stumbles and falls exaggeratedly, often coming dangerously close to careening into the crowd. This character, emaciated with exposed ribs, discusses a tragic epidemic, but presents it in dramatically fun manner, and thus accomplishes the original goal: normalising a taboo topic. In fact, Anakande is often the finale in many masquerades, mostly because the performance is so unpredictable, exciting, and fun. The crowds’ enthusiasm for this character proves how effective the masquerade is in conveying the message. The collection presented in the book—the Jerome Bunch Collection—was assembled in 1967, 1976, and 1990. Exceeding 1,000 pieces, it is not only the largest collection of Kwagh-Hir material in the world, but also the only collection assembled decades ago. We have worked closely with the Nigerian government, the Tiv ethnic group, and the Kwagh-Hir association to ensure that we have their endorsement to possess, publish, and exhibit this material. 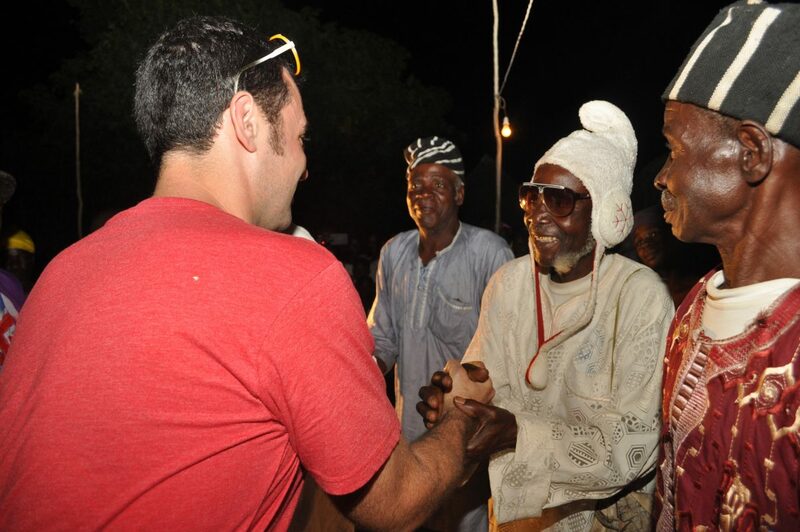 When Jerome Bunch’s son Richard, Prof. Iyorwuese Hagher, and I travelled to Nigeria in 2013, one of our goals was to see the Kwagh-Hir in person, but another was to search for anyone who might remember Jerome Bunch. We met two chiefs who said they remembered him. One spoke about him vaguely, and unfortunately, he has since died, so we can’t completely clarify what he said. Another chief said, “I remember him; we had to build up our muscle for him. He loved the Kwagh-Hir so much we let him take the pieces with him at nine percent.” This was significant because, while the nine percent comment is hard to translate, it describes the Tiv finally giving permission to someone to purchase their masks. It also seems to be a comment that appropriately describes Jerome Bunch, who was something of an imposing character. On our last day in Nigeria, we were greeted with a surprise—a proper initiation into the Tiv ethnic group, and the appointments as tor kwagh-hir (king), chairman, and secretary of the newly created Jerome Bunch Kwagh-Hir Group, USA. Our first major effort as members of this international arm of the Kwagh-Hir is our book. While there have been a number of works documenting the playwriting, religious, and secular aspects of the Kwagh-Hir theatre, there has never been a volume specifically dedicated to the aesthetics and artistry of Kwagh-Hir sculpture, which was the primary goal of our book. 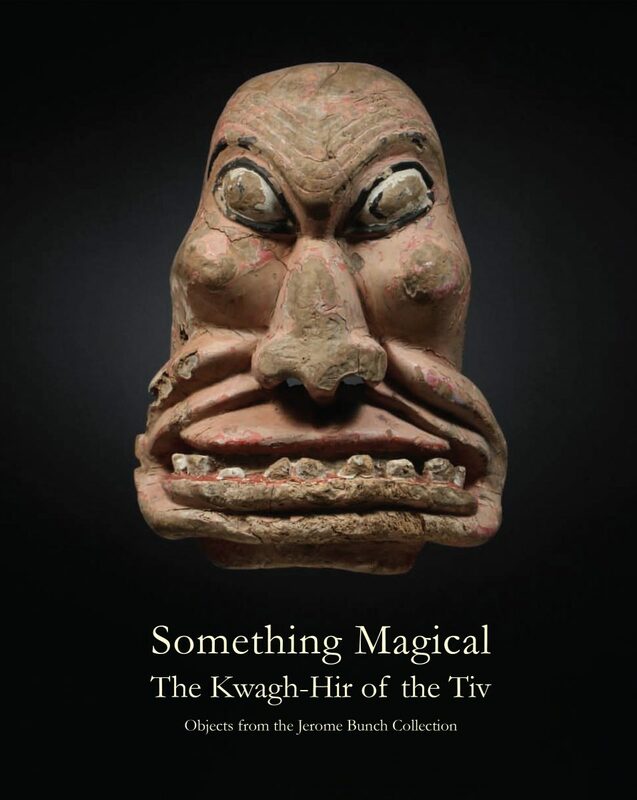 Below, I provide a preview of an introductory chapter from our new book, ‘Something Magical. The Kwagh-Hir of the Tiv’. 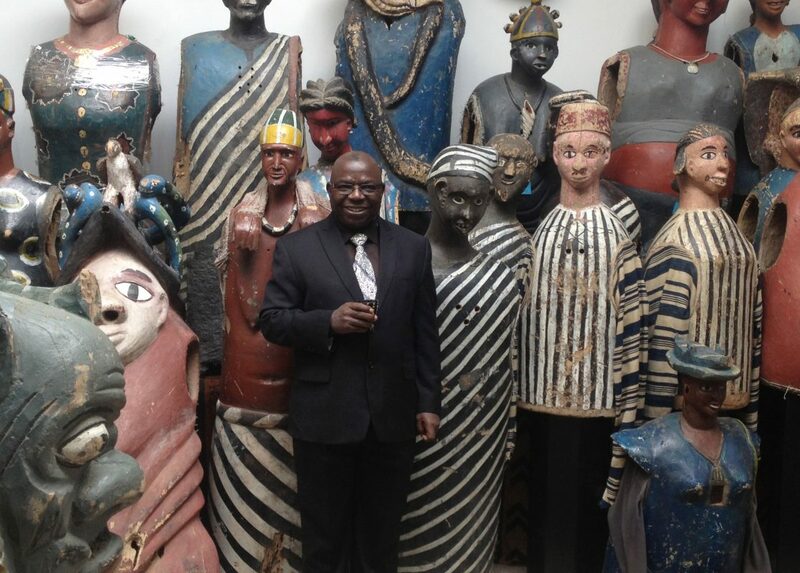 The roots of this project lie in 2010 when I was hired to appraise a collection of African art owned by Richard Bunch, which he had inherited after the death of his father, Jerome, in 2009. 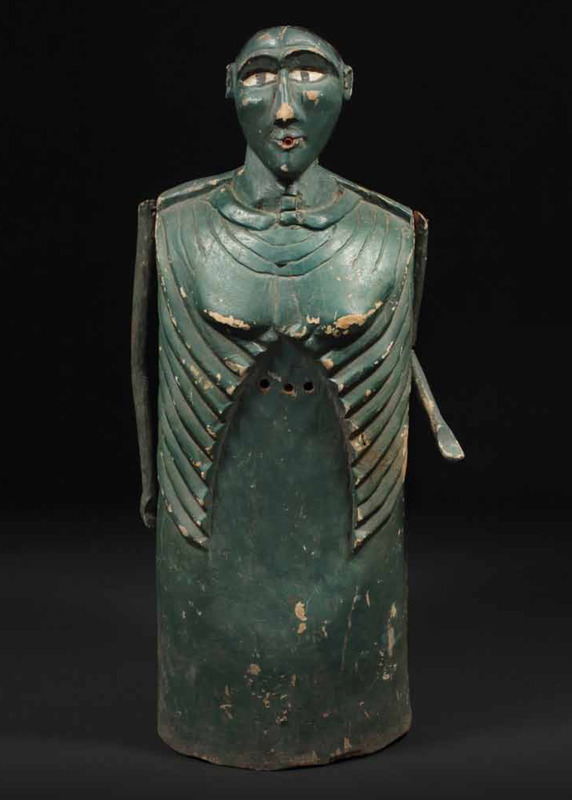 At the time, I assumed that only a catalogue from one of the major auction houses could contain African art objects that might be completely new and unfamiliar to me. Otherwise, as far as I knew, every stone had already been turned over and every great adventure had already transpired. It still thrills me to have been so entirely wrong. During his service in Africa with the French Foreign Legion from 1939 until 1941, Jerome Bunch developed a passion for all things African. 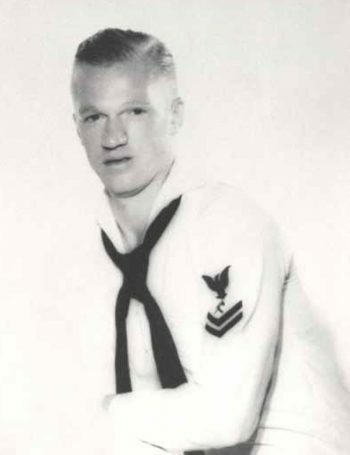 He joined the U.S. Navy after Pearl Harbor but later returned to Africa. As "someone who would rather fight than eat," travelling to Nigeria decades later and collecting art despite the looming outbreak of civil war, seemed more a challenge than a risk. Indeed, his first trip dedicated to collecting was to Nigeria in 1967 on the eve of the bloody Biafran War. After the war, he regularly returned to Nigeria to collect, and he expanded his collecting endeavours to encompass Mali, Ghana, Cameroon, Sudan, and Zaire (now the Democratic Republic of the Congo). While Richard was aware of his father’s travels and passion for collecting, he was unaware of the massive scale of Jerome’s collection. 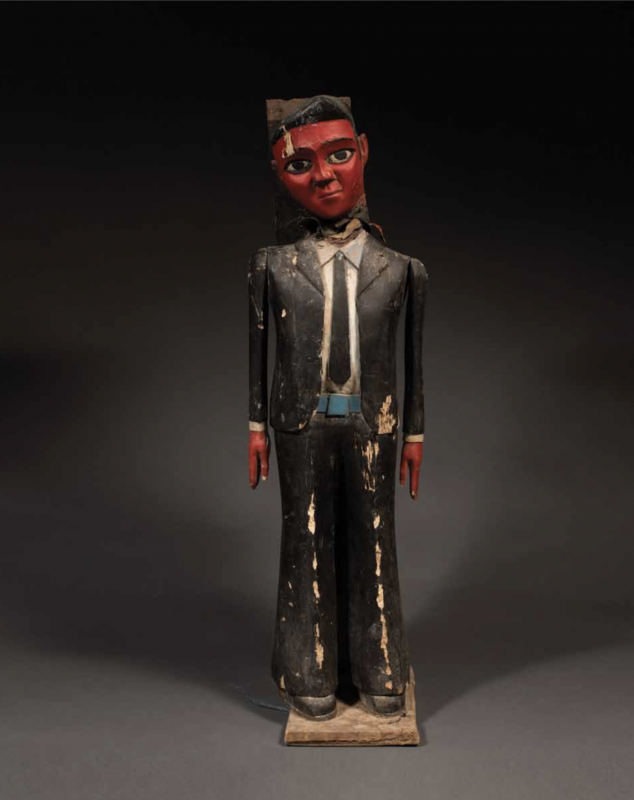 At the time of Jerome’s death, there were only a few works of African art displayed in his home. Unbeknownst to Richard then, there were also a few dozen storage lockers spread across Silicon Valley, literally crammed to the rafters with African art. The adventure began as Richard and I visited the storage lockers, one after another, and found each so densely packed that rolling up the steel doors revealed only a glimpse of what might be hidden within. It became apparent, as we sorted through the material inside them, that Jerome had been a focused collector, concentrating on specific forms rather than simply buying in bulk. For example, he had amassed hundreds of doors and costumes from the Igbo, but practically no other material from that culture. Phyllis Hattis Rubin, widow of the renowned MOMA curator, art historian, critic, and collector William Rubin, compared Bunch’s collecting style to that of the artist Arman: more of an accumulator and assembler than a classic art collector or connoisseur. Rather than aspiring to create an encyclopedic collection of tribal art, Bunch, like Arman, sought the objects that revealed variations on a shared theme. 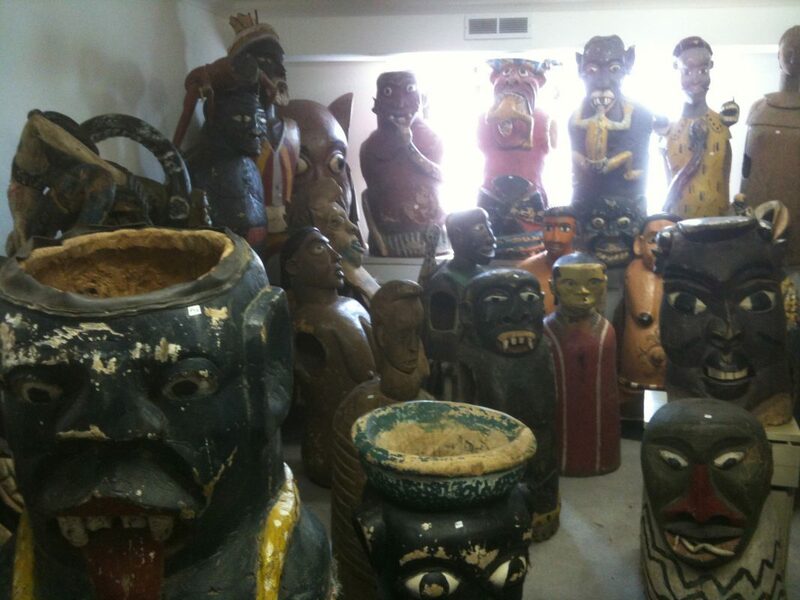 Few collectors have ever managed to acquire the sheer number of objects that jammed Jerome’s storerooms while simultaneously maintaining any sort of discernible goal. Knowing that much of the collection reflected Jerome’s enthusiasm for Nigerian material, I supposed that the 400 or so bizarrely sculpted and dramatically painted body, face, and helmet masks that stared back at us might have some connection with the Yoruba body masks I had seen in a handful of museum collections and publications. 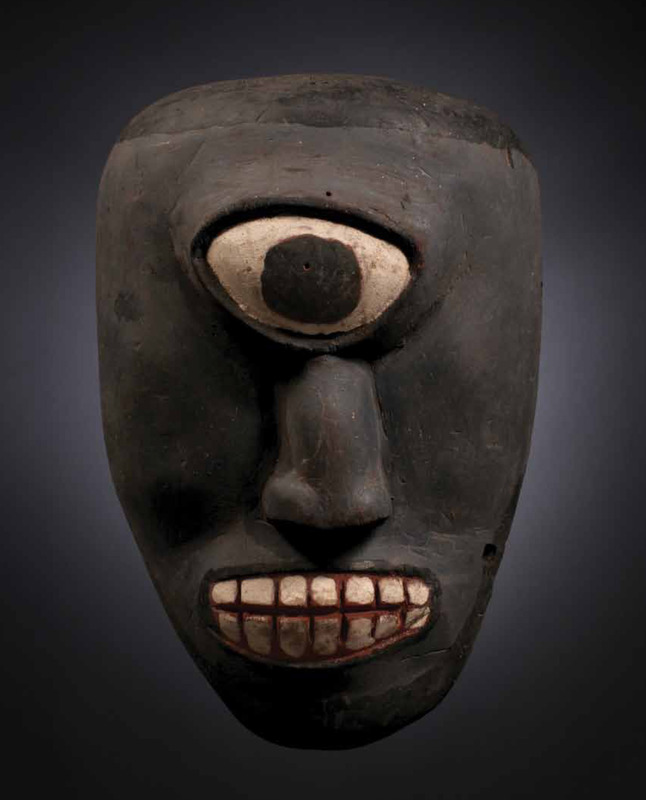 After spending two fruitless years trying to establish a link with the Yoruba by poring over books and consulting with scholars, it was clear that these masks were a distinct and non-Yoruba tradition. When we had almost given up hope, Richard and I happened upon a bootleg DVD called Kwagh-Hir Special. Thirty seconds into the film, we knew we finally had our answer, and we now had the keyword we needed to open the door. It was a genuine epiphany. Now, the search became one for more information. A few articles, a few pictures, and numerous pages found online referenced the name of Professor Iyorwuese Hagher, the executive director of the African Leadership Institute, a former Nigerian senator, and the former Nigerian ambassador to Canada and Mexico, among a great number of other achievements. Because he was also the author of a number of books on the Kwagh- Hir theatre, he immediately became our primary focus. When I caught his ear, we moved quickly, and he agreed to come to California immediately to view the collection. Upon viewing the collection, Prof. Hagher declared it to be the finest collection of Kwagh-Hir masks in the world and certainly the largest group of them outside of Nigeria. Further, we learned that the Kwagh-Hir dates from the time of Nigerian independence and is a largely secular tradition—at least to the degree that the secular can be separated from the sacred in African art. 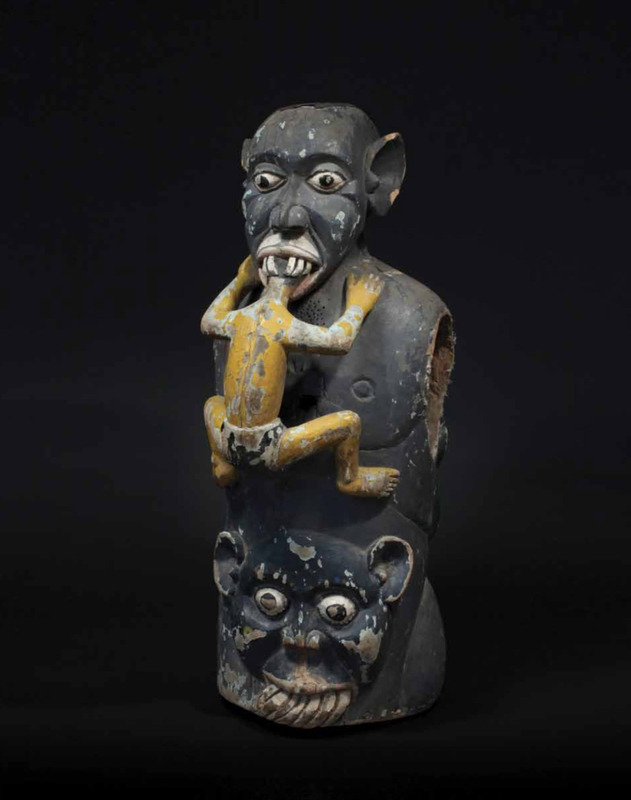 As such, unlike much of the cultural property that left Nigeria in the wake of the Biafran War, this collection would not have been subject to cultural property restrictions. 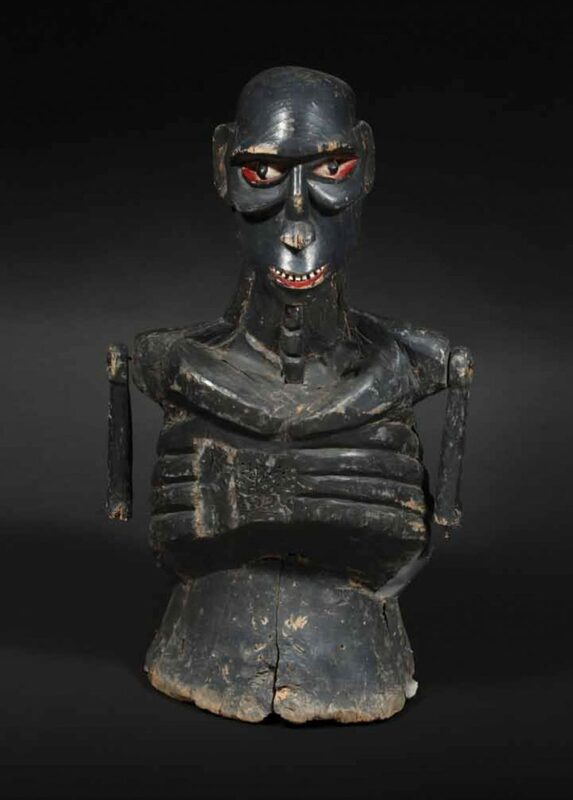 Some of the pieces were purchased directly from the Kwagh-Hir performance societies, while others were found in the bush where they had been abandoned and left to decay. The Kwagh-Hir is a public performance vehicle for expressing stories, news, and current events while also reinforcing traditional religious beliefs and conveying otherworldly tales. The most familiar parallel to it in the West may be the Punch and Judy show, in which a recognisable cast of puppet characters lampoons current political figures and events in the news while also referencing an array of cultural mores. While the characters of Punch and Judy, and indeed from Commedia dell’Arte from which it derives, are limited, those of the universe of Kwagh-Hir are vast in number and complex in form. 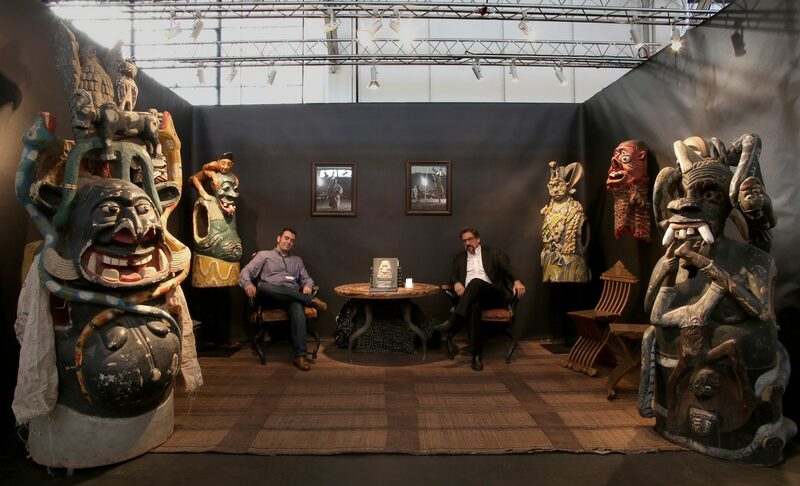 Often monstrous in appearance, the complex elements of each have allegorical meanings familiar to audience members. Some of the body masks weigh more than 100 pounds and dancing them is no small feat. Each Kwagh-Hir character is associated with its own song that both heralds its appearance and creates a non-visual layer of recognition for audience members. An important part of our research, both in interviews and in the eld, has been to record as many of these songs as possible. They are reproduced along with the appropriate masks in the following pages. The Kwagh-Hir went into decline in the late twentieth century but is now active again, in no small part due to the efforts of Prof. Hagher. We hope that presenting the collection in this book will not only memorialise the collecting passion of Jerome Bunch but will also allow an entirely new audience to appreciate the remarkable artistry associated with the Kwagh-Hir. We hope to continue to conserve and solidify this remarkable living tradition of the Tiv and to share it with the broadest audience possible. Hopefully, our book is just the first step toward that end, as the Kwagh-Hir theatre is an incomparable collaborative art form worthy of the world’s attention. The book can be ordered from BFP Publishing.